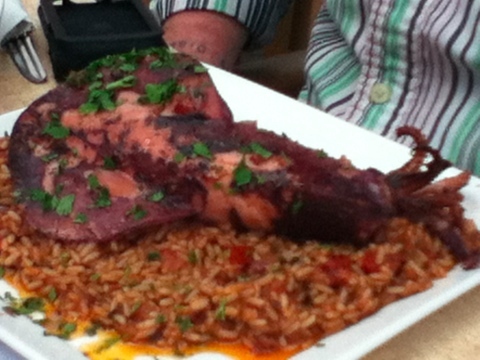 Before I went to Malta, I was warned that British food is quite popular there and not to get my hopes up. Although I enjoy British food, they’re not exactly known for their wild flavors. I went in with low expectations, but I was pleasantly surprised by Malta’s dining options. To be fair, there were several restaurants that looked phenomenal, but we were in the mood for laid-back meals on the beach and couldn’t be bothered to dress for fine dining. Sometimes a girl just needs nachos. The first place I’d recommend is Surfside Bar and Grill in Sliema. It’s a typical sports bar, but it’s spread over several levels, offering terraced views and comfy sun loungers right on the beach. They offer a sports-themed menu, reasonable prices, and friendly staff. We split a calamari appetizer and a pizza for two but we could have easily shared a single’s pizza, as the portions were enormous. We topped it off by ordering fruity drinks complete with umbrellas, and getting our first sunburns of the trip. The next place we really enjoyed was Mr. Fitz Restaurant in Marsaxlokk. 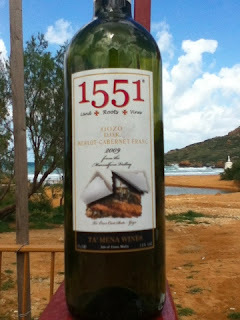 After browsing the drinks menu, my adventure partner noticed that a “full” measure of wine was 5 euro. Confused, he asked what a “full” meant. The waiter clearly thought we were idiots and explained that it’s a full bottle. With prices like that, we knew we’d found love. I once again had the calamari, but my adventure partner went for a full squid. It was delicious, perfectly cooked on a bed of seasoned rice. You can’t help but appreciate the freshness of the seafood as you sit a mere 3 feet away from the water. Our favorite place by far was Grand Slam Chilidogs in Mellieha. Their advertisement was spot on; I was in hot dog heaven! Yes, we flew all the way to Malta and ate chili dogs two nights in a row, but it was as much for the company as the menu. The owner let us watch Animal Planet and gave us so much extra food. Hanging out and chatting with her made me feel like I was at home again. The friendliness of everyone we met was a true selling point of Malta. From chili dogs to corner stores, we felt welcome everywhere we went. An added bonus of many bars and restaurants is that they offer free Wi-Fi, which is always a nice touch. We spent far longer than we would have at City of London Pub in St. Julians, simply because they were a pleasant place on the water and had fast Internet. The local drinks in Malta are just as low key as the food. We fell in love with Cisk on the first day. It’s a light, easy-drinking lager, not unlike Coors or Stella. 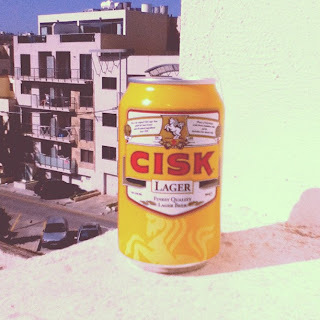 Their low-carb version, Cisk Excel, actually tastes decent as opposed to most low-carb beers I’ve tried. 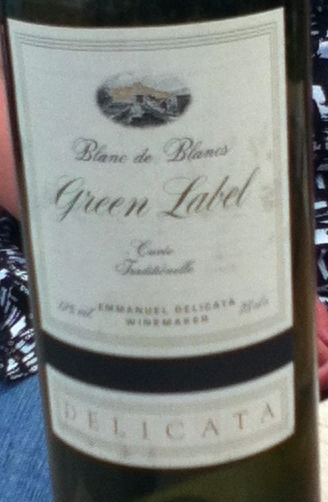 Our favorite wine in Malta was a recommendation from a friend, Green Label, by Emmanuel Delicata Winemakers. The Red Label is equally good, if you’re not a connoisseur of white wine, and both can be purchased for less than 3 euro at most convenience stores. White wine, green label. Makes perfect sense. Another local white that I appreciated was the Caravaggio Pinot Bianco from Marsovin Winery. To make sure we’d experienced both islands’ wines, my adventure partner selected a delicious Merlot-Cabernet Franc blend called “1551” from Ta’Mena Winery in Gozo. We have plenty of other places we want to try on our next trip to Malta. I was looking forward to having the traditional rabbit soup and dining at Guiseppe’s, but in the end I’m glad we stuck to casual dining. It was the perfect complement to our days of lounging on the beach.